Welcome to the Newport Harbor Expo 2011 Show and Sale! 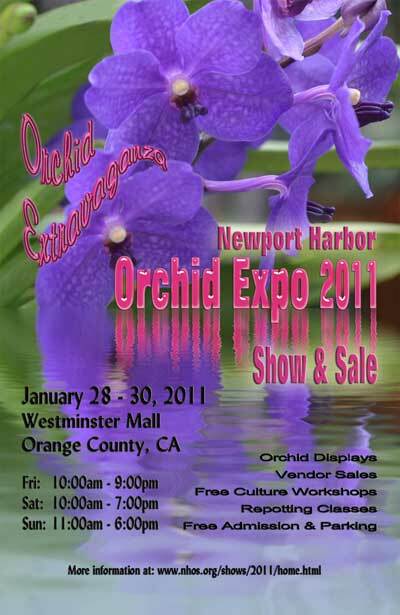 The Newport Harbor Orchid Society will host its 10th Annual Orchid Expo and Sale on Friday, January 28, 2011 through Sunday, January 30, 2011, at the Westminster Mall, in Orange County, California. This year’s event, themed “Orchid Extravaganza” will showcase thousands of orchids in bloom from all over the world. Orchids are the largest family of flowering plants with over 35,000 known species and hybrids, and they grow in every part of the world. Without having to leave Southern California, show goers will be dazzled by the diversity and beauty of the orchids to be displayed by professional growers, area orchid societies, and individual hobbyists. A large sales area will feature twenty-five expert commercial growers who will be offering unique species and hybrids for sale. Free culture classes and workshops will be conducted by experienced orchid hobbyists and professionals including Paul Gripp of Santa Barbara, Dr. Norito Hasegawa, and Peter Lin, all three days of the show. There will also be two free potting workshops designed specifically for new growers. An exhibit of orchid art by members of the Westminster Mall’s Kids Club will also be on exhibit during the show. Judging of the plants will be conducted by accredited judges of the American Orchid Society and the Cymbidium Society of America as well as by local society members. The two potting workshops are scheduled for Saturday, January 29, and Sunday, January 30 at 4 pm both days. Registration is limited to the first 20 registrants for each class. To register, send an e-mail providing your name and phone number. The Westminster Mall located in Westminster, CA with easy access from the 405 Freeway and the Bolsa exit. Parking is free. The mall is fully handicap accessible. Friday, 10 am – 9 pm, Saturday, 10 am – 7 pm, and Sunday, 11 am – 6 pm. Join our mailing list to receive the latest news and updates from Newport Harbor Orchid Society.